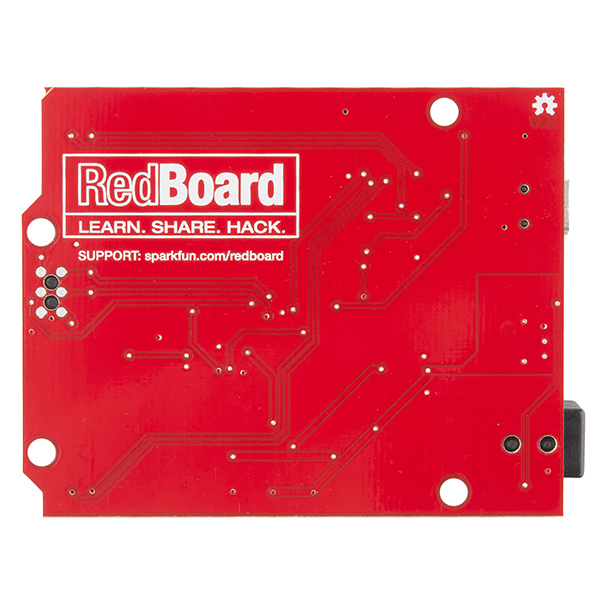 This version comes with our newest SparkFun RedBoard! Also included is a multitude of parts and sensors so you can start messing around with projects. 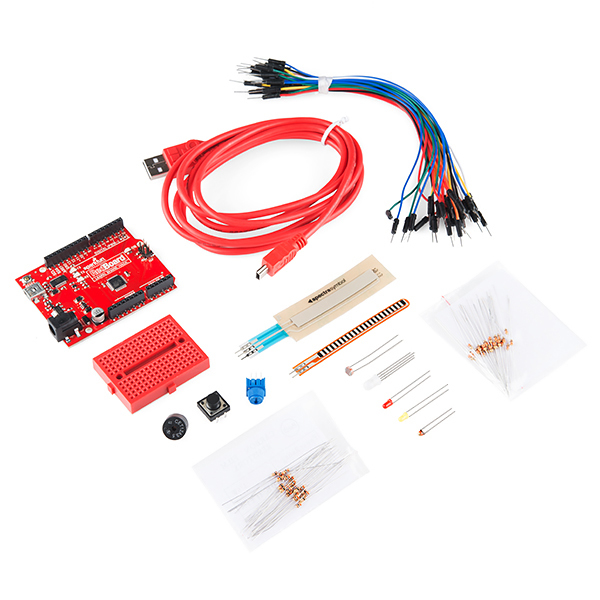 If you are looking for a great starting point into programming or are simply on a budget, look no further than the RedBoard Starter Kit. 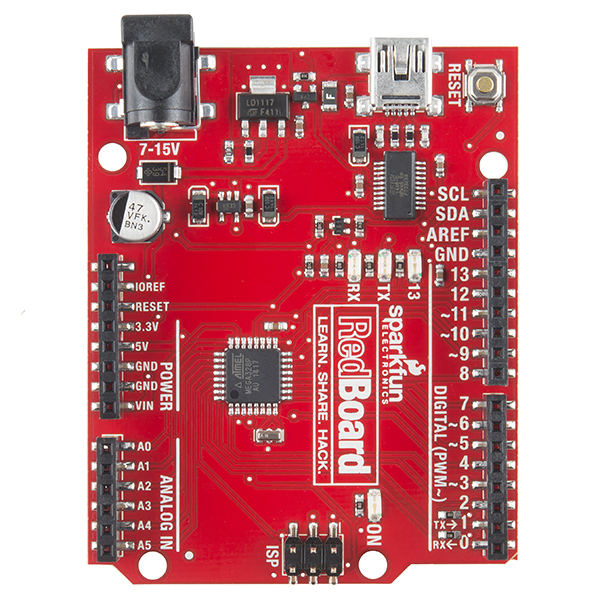 RedBoard - Programmed with Arduino - The SparkFun RedBoard, fully assembled and tested. SparkFun USB Mini-B Cable - This 6' cable provides you with a USB-A connector at the host end and mini-B connector at the device end. Red Miniature Breadboard - Excellent for making circuits and connections off the Arduino. Male to Male jumper wires - These are high quality wires that allow you to connect the female headers on the Arduino to the components and breadboard. Flex Sensor - Originally designed for the Nintendo Power Glove, now you too can measure flex! SoftPot - Measure position along the softpot by looking at the change in resistance. It's like a touch sensitive volume slider. Photocell - A sensor to detect ambient light. Perfect for detecting when a drawer is opened or when night-time approaches. Thermistor - A sensor for detecting ambient temperature and temperature changes. Tri-Color LED - Because everyone loves a blinky. Use this LED to PWM mix any color you need. Basic LEDs - Light emitting diodes make great general indicators. Linear trim pot - Also known as a variable resistor, this is a device commonly used to control volume, contrast, and makes a great general user control input. Piezo Speaker - Make wonderful, brain splitting noises, alarms, and possibly music! 12mm button - Because big buttons are easier to hit. 330 Ohm Resistors - Great current limiting resistors for LEDs, and strong pull-up resistors. 10k Ohm Resistors - These make excellent pull-ups, pull-downs, and current limiters. My budget per student can't accommodate the 100$ per kit price of the SIK. But this kit seems to do a lot of it anyways. Can you say which of the 15 things in the SIK Guide this one covers? It looks like it will make 8 of the 15, but you could easily get some singles of the missing components to make 1 full SIK for teaching purposes. I believe it will build all the circuits except numbers 4, 7, 8, 12, 13, 14, 15 - which require components that are not included. Certainly enough to do both beginning and advanced Arduino programming and introductory circuits. I'm not sure what you are referring to? The description and the picture on this page both clearly show the mini breadboard. There also is no manual for this kit. The manual in the list above (Documents > SIK Guide) shows a different breadboard than the one that ships with this kit. I'm happy with Spark Fun's prompt and professional order fulfillment, and this kit comes with all the parts listed in the "parts wish list", but the manual (which is what I was drooling over waiting for this starter kit to arrive) shows a more expensive kit. I was a bit crestfallen when my starter kit arrived, as I had somehow thought I'd be able to do more, like the manual shows. However, I can see now that the mistake was mine, and in no way Spark Fun's.